Right off the bat, I’ll say that I really enjoyed Quantum Of Solace. Following up Casino Royale was always going to be a big ask, and the film-makers have fallen short and presented us with a very flawed film. However, the film still has some truly great new Bondian moments, as well as providing a few reminders of the films of the past. The film opens half an hour after the close of Casino Royale and James Bond (Daniel Craig) is racing along an Italian coastal road in his Aston Martin. Hot on his trail are a few carloads of goons, who are firing their machine guns at him. Thankfully, it would appear that the same fellow who trained the Storm Troopers in Star Wars trained these goons. Even at point blank range they can’t seal the deal and kill Bond. Although it is never made clear, it is safe to assume that these villains chasing Bond work for the same group as Le Chiffre and Mr. White (the villains from Casino Royale). I don’t think I am giving too much away when I say that this outfit is the ‘Quantum’ group. It appears that Quantum is the new S.P.E.C.T.R.E. Driving, Bond is able to out maneuver the bad guys and is free to continue his journey. He arrives safely in Sienna, although his car is a little worse for wear – all shot to pieces and missing a door. He drives under cover, pulls up and then pops open the boot (that’s ‘trunk’ for you American readers). Inside is a very visibly shaken Mr. White (Jesper Christensen), the surviving villain from Casino Royale. After that brief cowcatcher, we have the main title sequence. This time it has been put together by a company called MK12, who director Marc Forster has called in to do the graphics on this film. I must admit that I was slightly under whelmed by the visuals, especially when compared to Daniel Kleinman’s recent work, or that of the maestro himself, Maurice Binder. In my other life, when I am not writing about spy films, I while away my hours as a low-rent graphic designer, so I am always fascinated to see how the titles are presented. I was intrigued to note that they used a Herb Lubalin inspired stencil font for the titles. Now possibly I am reading too much into this, but this font style was very popular in the mid sixties through to the early seventies. Is this the designer’s subtle love letter to the Bond films of the past? And while talking about fonts, it is interesting to see that when Bond arrives in each new location, the city’s name is displayed in a different font, which reflects the nature of the country they are in. I think this is pretty cool – after all, the seasoned spy film viewer may have burst out laughing if green phosphorescent computer type flickered across the bottom of the screen. After the titles we are back in Sienna and Bond, M (Judi Dench) and another agent named Mitchell are interrogating Mr. White. However the interrogation is short lived as Mitchell turns out to work for Quantum. Yes, he’s a bad guy. He attempts to shoot M and then flees with 007 hot on his trail. This diversion allows Mr. White to escape. After a chase over the rooftops, Bond catches Mitchell and rather unprofessionally kills him. It’s hard to get information from a dead man. The only lead M.I.6 has to work on, courtesy of some marked dollar bills, is a man called Slade who is currently in Haiti. Naturally Bond is sent off to interview the man, and after a meeting him (if you can call it that – yeah, he kills him) he is contacted by a girl named Camille (Olga Kurylenko). Camille leads to Dominic Greene (Mathieu Amalric), who is the head of an ecological business venture called ‘Greene Planet’. As you’ve come to expect from Bond films, Greene is not all he is painted to be. As the adventure unfolds, Bond reacquaints himself with a few allies from the past. The first is Rene Mathis (Giancarlo Giannini). The scenes played out between Bond and Mathis are the best in the film – and dare I say it, some of the best in the series, recalling the relationship bond had with Kerim Bey in From Russia With Love. Another returning character is Felix Leiter (Jeffrey Wright). When Casino Royale was released, I was concerned with the new interpretation of the character. But by using Wright again, and providing a bit of continuity, which Felix has sadly missed in the past – I am happy to accept the new Felix. Let’s just hope Wright continues with the role, and the charater does not have to be reinvented once again. The climax of the film takes place in a hotel in the middle of the Bolivian desert. 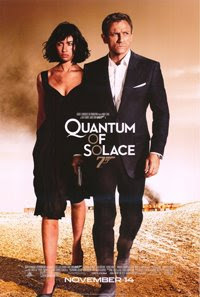 After seeing the movie I watched The Making Of …Quantum Of Solace on television. It answered one question that I had been asking myself – what is a hotel doing in the middle of the dessert and why would anyone want to stay there? In reality, the hotel is a real place, and is next to an observatory. Visiting astronomers and scientists stay at the hotel. Now, couple that little tidbit of information with MK12’s title sequence, which uses ‘star map’ graphics, and I begin to wonder if there was an excised sub plot pertaining to astronomy or astrology? One strange part about the ending is the lack of people at the hotel. There only seems to be one staff member servicing the entire building – hopefully she made it to safety. Also, earlier in the movie, Mr. White says about the mysterious Quantum group, ‘the first thing you should know about us, is that we have people everywhere’. It appears that ‘everywhere’ does not include in the middle of the Bolivian dessert, because Greene only has one odious, pudding bowl haircutted minion on hand to protect him (there may be another fellow who hands over a suitcase of money, but he just seems to dissappear). There may be plenty of explosions and flame – as you’d expect at the climax of a Bond film – but Bond really only has to contend with Greene. There is no evil army of Quantum soldiers on hand to provide a modicum of resistance. The main Bond girl is Camille, played by Olga Kurylenko, who we all fondly remember from The Hitman – don’t we? Camille is an interesting character with a back-story that could have been lifted from a Spaghetti Western. Her father was killed, and her mother and sister raped before her eyes. She, herself was left to die in a burning house. She now has scars, a fear of fire – understandable really – and a burning (sorry) desire for revenge. The other girl in Bond’s life at this time, is agent Fields (Gemma Arterton). Fields is a M.I.6 operative stationed in South America. After a rocky start, she becomes Bond’s ally when he arrives in Bolivia to continue his investigation into the business dealing of Dominic Greene. Those of you who are regular readers here, may have noticed that my reviews are rather formulaic. Generally when describing the plot, I write up to the point where the mission is declared. That is to say that I describe the story up until the point where the secret agent/hero has his mission outlined by his superior. This has worked well for the Bond films because this is usually the ‘M’ scene. The Bond formula consisted of a heinous act being committed and then M sending his or her – depending on your favourite M – best agent out to round up the perpetrators. But the last two films in the series have altered that formula. M and Bond no longer seem to know what’s going on. In Quantum Of Solace, although M and Bond meet early on, the mission isn’t really declared. There are a few hazy leads, and ‘people of interest’, but no actual crime or mission to investigate. Look at the films of the past – in Dr. No, Bond is sent to investigate the death of Strangways – in Goldfinger he investigates Auric Goldfinger, who M suspects is a gold smuggler – in Diamonds Are Forever, it diamond smuggling – I’m sure you get the idea. But nothing is defined in Quantum of Solace. M and Bond then keep in continuous contact throughout the mission (of course, ignoring the political and trust issues inherent in the story). Now, not that this is necessarily a problem, but this new relationship between M and Bond poses a dilemma for future installments in the series. As I have already alluded to, in the past Bond was called into M’s office and given his mission briefing. As we all fondly remember, Bond would also flirt with Miss Moneypenny on his way in and out of M’s office. And also quite often, Bond would also receive the latest hi-tech gadgets from Q. But with this new dynamic, there is no briefing scene, and therefore, very little room for Q or Moneypenny. I am sad to say, we may have seen the last of these much loved characters. All of the above are simply my observations and ramblings – not really intended as criticism, more of an analysis of how the Bond series is changing. But I do have a criticism, and that is the Bourne inspired rapid cut editing that takes place during the action scenes. The technique is so abrasive it ruins the flow of the movie. I have heard it said, that this style of editing draws the viewer into the scene. The viewer is supposed to feel like they are right beside the hero in the fight or chase scene. I actually believe that the rapid editing diminishes the power of the sequence. It is often used when an actor doesn’t have the skill set required to sell the action scene he (or she) is participating in. If you look back to the first Lethal Weapon film (how long ago was that? ), you may remember that the film ended with a horrendous, heavily edited fight scene between Mad Mel Gibson and Gary Bussey (who is only a little bit mad). Both men were not trained fighters – skilled in whatever martial art was supposed to be on display – and the fight was heavily edited to hide the actors shortcomings. Now applying that school of thought to the new Bond film, were the action scenes edited that way to hide Daniel Craig’s inability to perform an action scene? Of course not! We have all seen Casino Royale and know that Craig can handle fight and chase scenes. So begs the question, why would you dilute Craig’s performance by using this technique? The answer is Bourne, Jason Bourne. Once upon a time, Bond was the trailblazer and other spy films would follow and blindly imitate Bond. But now Bond has become a follower. I would have thought that the film-makers would have learnt their lesson with Die Another Day, where they adopted a style of editing that mimicked that of the hi-tech films of Tony Scott (Scott’s editor on Spy Game, Christian Wagner, also edited Die Another Day). The editing ruined Die Another Day, and while not as destructive here, it certainly reduces the impact of Quantum Of Solace. As I said at the top, Quantum Of Solace is a flawed film, and many commentators are sticking the boots in. I choose not to do that. It is different, and it must be a tough tightrope to walk when you add another piece to a franchise that has been going over 45 years. You have to keep the old fans happy, but also win over a new generation of filmgoers who will (hopefully) continue to support the franchise. I, as one of the old school fans, gladly accept and embrace Quantum Of Solace as the latest Bond film. I enjoyed myself for the full 105 minutes of it’s running time and on future viewings I am sure I will do so again. But I hope for future installments in the series, please Michael G. Wilson and Barbara Broccoli (or the director that you entrust to carry on the legacy), do not slavishly follow filmic fads. You know better than that. To read Tanner’s review at the Double O Section click here. To read Paul’s review at Bish’s Beat click here.